This tutorial provides you with a foundation for working with Adobe Dreamweaver div tags and CSS IDs. It is the fourth lesson in the Adobe Dreamweaver CS5 Digital Classroom book. For more Adobe Dreamweaver training options, visit AGI’s Dreamweaver Classes. Your page is coming along nicely on the style front, as you have used quite a bit of CSS, but looking at your page, it’s fair to say that it is still lacking a cohesive style. All your various headings and paragraphs, as well as your list, are floating about on the page, and with the exception of the copyright text at the bottom of the page, it’s difficult at a single glance to get a sense of where one section ends and another begins. It’s time to add more structure to your page through the use of the <div> tag and more control of your CSS with ID selectors. Let’s look at the structure first. It would be nice to gather the text on the bottom of your page, starting with the line, Occasionally we gather…, and then the two paragraphs below, and put it all into a single section. You could then take this new section and style it separately from the rest of the page. This is possible with the <div> tag. In this exercise, you will begin by creating a footer ID. 1 Click and drag to select all the text from the line, Occasionally we gather…, down to the bottom of the page. You will be grouping these three paragraphs together. 2 Double-click on the Insert tab to open it; if the drop-down menu is not set to Common, do so now. In the Common section, press the Insert Div Tag ( ) button, and the Insert Div Tag dialog box opens. In the Insert section, the default choice is Wrap around selection; this is exactly what you want to do, so leave this option as is. Press the Insert Div Tag button in the Common section of the Insert panel. A <div> tag by itself doesn’t do anything until some CSS properties are attached to it. In other words, unlike other HTML tags, which often have a default visual effect in the browser (think of headings), the <div> tag has no effect on your rendered page unless you specifically instruct it to. You will now get to do this. 3 In the field labeled ID, type footer. Just like classes, IDs should have good, descriptive names to help identify them. You’ll now apply a background color of white to the entire block of text you selected. Notice that there is a field for class as well. Classes and IDs are very similar. The difference between them is that classes can be used multiple times on different elements on a page, whereas an ID can only be used once. In this case, an ID is appropriate because there is only one footer on this page. 4 Click the New CSS Rule button. You needn’t change anything here; you are creating an ID with the name footer. The footer name is preceded by the pound sign (#). This is the main difference between ID names and class names. If this were a class named footer, it would be named .footer. Press OK, and the CSS Rule definition dialog box appears. 5 Select the Background category, then click on the Background-color swatch. Choose the pure white swatch (#FFF) and press OK. Press OK to close the Insert Div Tag dialog box. In Dreamweaver’s Design view, a box has appeared around the text and there is now a white background unifying the footer text. Set the Background-color to #FFF in the CSS Rule definition dialog box. If you haven’t guessed by now, these are the beginning steps toward page layout with CSS. A footer is a common element on most pages, and there are a few other obvious ones as well: headers, sidebars, and navigation bars to name a few. You’ll begin working with these page structures more deeply in upcoming lessons, but first you’ll need to have some more control of the CSS rules that you’ve been working with this lesson. Now that you’ve seen how to modify a few items in a single page at once, you can only imagine how powerful a style sheet shared by every page in your web site can be. When you create new CSS rules, you have the opportunity to define them in the current document or in a new CSS file. A collection of rules stored in a separate .css file is referred to as an external style sheet. You can attach external style sheets to any number of pages in a site so that they all share the same style rules. So far, you’ve created internal, or embedded, styles. This means you wrote the style rules directly into the page using the <style> tag. Although you can format a page with an internal style sheet, this method is not very portable. To apply the same rules in another page, you have to copy and paste the internal style sheet from one page to another. This can create inconsistency among pages if the same rule is updated in one page and not the other. To utilize the true power of style sheets, you can create an external style sheet that any and all pages on your site can share. When you change an external style, pages linked to that style sheet are updated. This is especially handy when working with sites containing many pages and sections. Move rules from an internal style sheet into a new CSS file. Define styles in a page in a new document using the New CSS Rule panel. Create a new CSS document from the Start page or File menu. Now you will export internal styles from your events.html page into a separate CSS file so that other pages may share them. 1 With the events.html document open, expand the style sheet shown in the CSS Styles panel so that you can see all the rules you have created. If you have limited screenspace, double-click on the Insert panel to collapse it. 2 Click on the first rule below the <style> tag at the top of the panel and then scroll down if necessary to locate the last rule. Shift+click the last rule in the panel so that all the rules are selected. In the upper-right corner, press the CSS Styles panel menu button ( ) and choose Move CSS Rules. 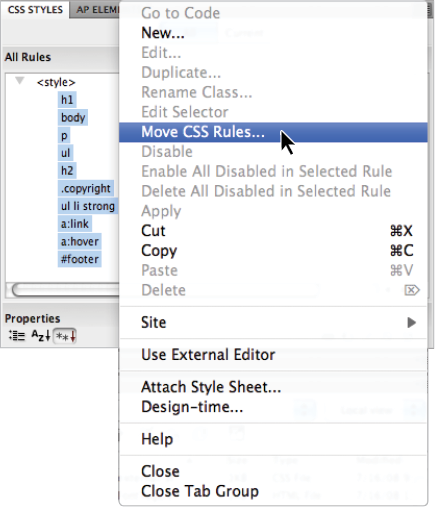 Select all rules in your style sheet and then choose Move CSS Rules. 3 The Move CSS Rules dialog box appears, asking if you want to move the styles to an existing or a new style sheet. Select A new style sheet and press OK.
4 A Save Style Sheet dialog box appears, asking you to choose a name and location for the new file that is about to be created. Name it mystyles, navigate to the root folder of your site (dw04lessons folder), and choose Save. 5 Your CSS Styles panel now shows a new style sheet: mystyles.css. The internal style sheet (shown as <style>) is still in your document, but it contains no rules. Click the plus sign (Windows) or arrow (Mac OS) to the left of mystyles.css to expand it and reveal all the rules it contains. There should be no surprises there; the same rules that were in your internal style sheet are now in an external one.